Dr. Hoffmann accepted a position as the John Stauffer Professor of Analytical Chemistry in 2015, moving to CLU from Gonzaga University in Washington State. She teaches General Chemistry, Quantitative Analysis and Instrumental Analysis, as well as Capstone and the occasional upper division course such as Chemical Investigations of Art. Dr. Hoffmann has an undergraduate degree in Chemistry from Mount Holyoke College in Massachusetts, and got her doctorate in Biochemistry from Oregon Health and Sciences University in Oregon. The Hoffmann Lab's research reflects the biochemistry training and is focused on the structural and functional characteristics of a family of bacterial proteins that could be an excellent antibiotic drug target. 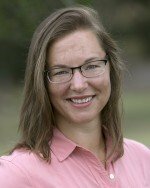 Dr. Hoffmann is a water person in her spare time; she enjoys surfing, outrigger canoeing, stand-up paddleboarding, and boating whenever she isn't grading or chasing her toddler. Drug resistance in virulent bacteria has grown so remarkably over the past several decades that the need for new antibiotic targets is now reaching a critical point. To asses the potential of one such target, the Hoffmann lab has identified a unique protein critical to bacterial virulence and is attempting to characterize fully the atomic structure, functional binding requirements, and relative speed of action. In the long term, the lab will design, create and test inhibitors for the proteins, which may eventually serve as starting points for a new family of antibiotics, expressly targeting pathogenic bacteria. Most bacteria acquire the critical resource of iron through the synthesis of small metal chelators called siderophores. Siderophores are exported from the cells, bind some iron, and import the iron-containing molecule back into the cell. Pathogenic bacteria in particular often synthesize siderophores using proteins called NIS synthetases, which may be one of several proteins in the sythetic pathway, but are always represented at least once. NIS synthetases are excellent antibiotic targets because no protein has ever been found with the same three dimensional fold, so the side effects of a drug designed for this rare shape would be minimal. The chemistry of NIS synthetases are also particularly interesting: the proteins create an amide bond between an amine and carboxylate, just like the peptide bond created by ribosomes, but no ribosome is involved. In order to design a drug for these proteins, we must first know the intricacies of the shape, then design a chemical inhibitor (AKA drug) to fit that shape. The Hoffmann lab is currently pursuing x-ray crystallographic structures of our two NIS synthetase proteins both unbound to any substrates (apo), and bound to various permutations of substrates, analogs, and inhibitors. We are additionally collecting thermodynamic data on binding using isothermal titration calorimetry, and looking at using the changes in heat to also measure kinetic turnover. We have made good progress solving our first structures, and preliminary data with ITC has been very useful determining which substrates to add to the crystallization mix. Researchers in the Hoffmann lab have the opportunity to work on these projects using a combination of virtual model building, analytical thermodynamics and kinetics functional assays, biophysical techniques of X-ray crystallography, and biological techniques like site-directed mutagenesis. Researchers learn on-the-job, and grow in expertise in individual techniques as well as ability to independently direct their projects as they spend semesters and summers becoming experts.